Property 4: Watsons Cottage Rural 4 Kms from town centre. Property 6: Ever wanted to stay in a beautiful Character Home? 'La Finca', a sensational place, come and relax! Property 13: 'La Finca', a sensational place, come and relax! Property 28: Get away from it all! 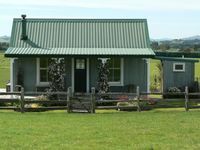 Property 36: Green Barn accommodation on a working farm in the heart of Gladstone. We really enjoyed our (brief) stay. Fire kept us warm and the kids loved their room. Rustic, farm feel and a big yard to run around.